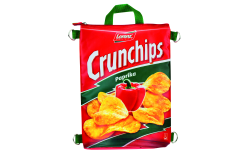 Even couch potatoes venture outdoors sometimes – how practical if they can always carry their favourite crisps around with them – in the form of a functional cool bag. The cooling device that was jointly developed by Crimex and the bag specialist Halfar is designed to look like a bag of crisps of the Lorenz brand. However, the stable nylon model with a PVC base doesn’t contain fresh Crunchips, but instead a large main compartment with a detachable divider for two 1.5 l bottles and a small compartment with a Velcro fastener for the EZetil cool pack provided. In addition to the full-surface imprint on the front and back, the Lorenz brand is also found on the zip as a logo in the form of a rubber badge pendant. As a practical companion for picnics, trips to the beach, etc., the bag keeps the contents cool for a long time and features a flexible, length-adjustable shoulder strap with padding, which is attached to the side rings using metal carabiners. Furthermore, the model is made out of one piece of food-safe plastic as well as being welded without seams, is leak-proof and can be cleaned in a conventional washing machine. The striking design of the product and the innovative shape of the cool bag turns it into an eye-catcher, which was why the jury awarded it a Promotional Gift Award 2017 in the category Custom-made Designs.